Listen to me talk about peeing my pants in public minutes before an audition on the episode titled "The Backbone of NYC." Grace Lynch interviews various members of New York's artistic community, exploring their views on their work and its impact. 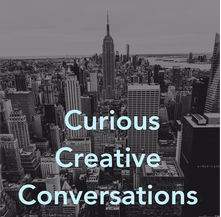 Open and casual conversations, this podcast will intrigue anyone excited by the expanding implications of the arts. I had so much fun giggling it up on this comedy podcast, "Emergency Contact." Listen to hear how I survived anaphylactic shock. Brian Russo and Andy Fitch have people tell good stories about bad injuries.